Description: For model B (Black letters with long A and S). This is a set of 12 self adhesive decals. These are printed on Mylar, not die cut. 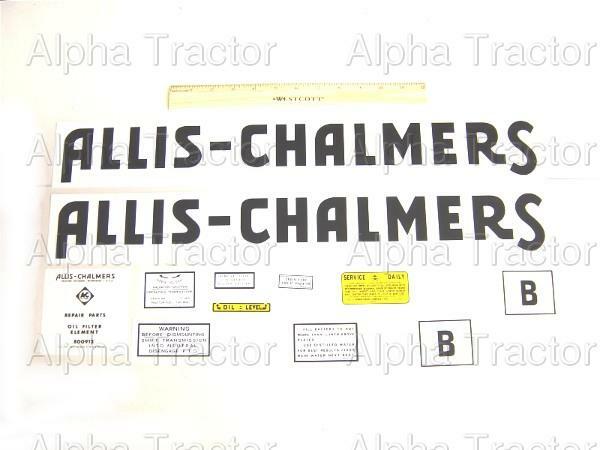 ABOUT THIS PAGE: You are viewing the product page for our Allis Chalmers B decal set. As one of the largest suppliers of new and rebuilt Allis Chalmers B tractor parts we most likely have the decal set you need. Use the information above including the decal set part number and picture (if available) to assist you in making your decision to purchase. If you are looking for a different decal set, or have trouble locating the Allis Chalmers B parts you need, we have MANY parts that are not listed on our website so feel free to contact us.